There are 5 Process Groups as per the PMBOK Guide – Initiating, Planning, Executing, Monitoring & Controlling & Closing. 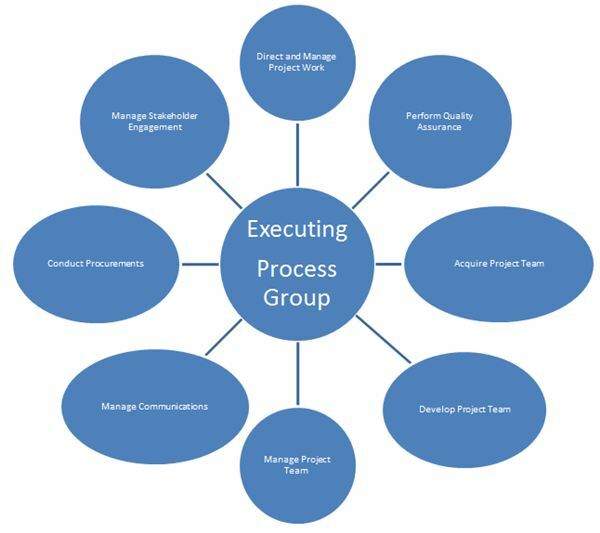 There are only 8 processes within the Executing process group. However, it is the area which gets the highest number of questions – 31% of questions (see latest PMP Exam Question Distribution). So if you master the 8 processes, you can answer 62 questions on the PMP exam. The Executing Process Group requires work on the following key things. Do note that these are not actual Process names as defined in the PMBOK guide, but the actual work required. It may not be in sequence, and you can do these activities in any order as they are required on your project. Acquire the team who will do most of the work. Work to produce product scope. Recommend changes, defect repair, preventive and corrective action coming from Planning, Executing and Monitoring and Controlling process groups. Implemented approved changes, defect repairs, preventive and corrective actions as required. Continuous process improvement to the processes, documentation and plans. Give recognition and rewards to team members and keep them motivated. Hold Progress meetings to ensure project is on track and any deviations are attended to at the earliest. Use Work Authorization systems to allocate work. Request Seller responses to your tender and outsourcing needs. Select Seller for your procurement needs. Make sure you understand these Executing processes extremely well for the PMP exam. Generally, there are no formula questions from Executing process group. You should be able to score good marks in these processes easily. All the Best! P.S: Join the PMP Exam Preparation Coaching Program and Be Ready for the PMP exam in 6 Short weeks.